Michael Kliën, Excavation Site: Martha Graham U.S.A. This event occurs off-site at Martha Graham Studio Theater, 55 Bethune St., Floor 11, Manhattan. Tickets can be purchased at the Martha Graham Studio Theater with cash only. Organized as part of the New Museum Spring 2016 R&D Season: LEGACY. Excavation Site: Martha Graham U.S.A. is co-presented by the New Museum, within the Spring 2016 R&D Season: LEGACY; Martha Graham Dance Company, as part of its 90th season; and Performance Space 122, as part of the COIL 2016 Festival. 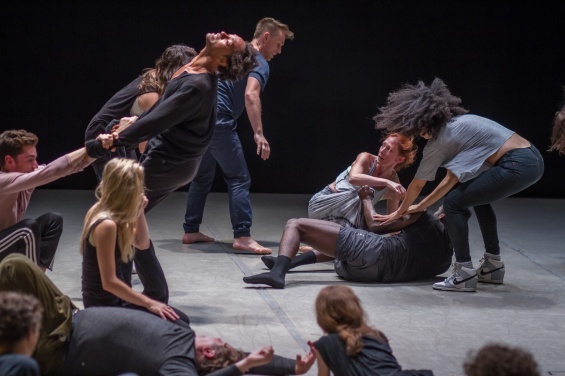 In this one-time-only dance event, a multigenerational group of performers from the Martha Graham Dance Company’s past, present, and future will excavate their relationships to Graham and the underlying “movement forces” that bind them to one another, to Graham, and to the Company. Organized by Austrian choreographer and artist Michael Kliën, Excavation Site: Martha Graham U.S.A. bypasses the institutionalized social structures of the Company to uncover new paths of organization and potential between its participants. The work utilizes strategies of social choreography developed in collaboration with dramaturge Steve Valk, who has organized a complementary discursive component that will unfold alongside the performance in adjacent spaces. Audiences will be invited to explore the work for any length of time and will be encouraged to move freely between spaces. Michael Kliën’s Excavation Site: Martha Graham U.S.A. is curated by Travis Chamberlain, Associate Curator of Performance and Manager of Public Programs, with generous support from the Austrian Federal Ministry for Education, Arts and Culture and the Austrian Cultural Forum New York. For the past several decades, Michael Kliën has been engaged in fundamentally deconstructing our civilization’s assumptions about choreography, dance, and culture. He set out to redevelop choreography as an autonomous artistic discipline concerned with the workings and governance of patterns, dynamics, and the relations of individuals to one another and to the circumstances of their environment. In response to the urgency of our contemporary ecological situation, this new conception of choreography engages its social potential to pursue sustainable orders of human relations (Social Choreography). Choreography, understood as an Aesthetics of Change, assumes the creative practice of setting relations, or setting the conditions for new relations to emerge. Over the years Kliën’s artistic development has been guided by the ideas of Gregory Bateson, Alain Badiou, Joseph Beuys, William Forsythe, Steve Paxton, Gordon Lawrence, Sophia Lycouris, and numerous close artistic collaborators such as Steve Valk, Jeffrey Gormly, Volkmar Klien, and Nicholas Mortimore, among others. Steve Valk is a contemporary dance dramaturge, visual artist, designer, lecturer, and a leading figure in the emerging field of Social Choreography. Influenced by his experience as a personal assistant to theater director Robert Wilson (1988–90) he joined Ballett Frankfurt as Head Dramaturge and creative collaborator for William Forsythe (1992–2004). From 1998 to 2004, his dramaturgical practice and focus on transdisciplinary networking strategies led to the development of a new participatory/situational epistemology for the institution of contemporary dance. From 2004 to 2011, Valk—in partnership with choreographer and Artistic Director Michael Kliën—served as Head Dramaturge and artistic collaborator at Ireland’s Daghdha Dance Company. Since 2012, he has been Director of the newly founded Institute of Social Choreography in Frankfurt, where he currently lives. Artist commissions at the New Museum are generously supported by the Neeson / Edlis Artist Commissions Fund. Artist residencies are made possible, in part, by Laurie Wolfert. Additional support is provided by the Toby Devan Lewis Emerging Artists Exhibitions Fund. Additional support for “Seasons” is provided by public funds from the New York State Council on the Arts with the support of Governor Andrew Cuomo and the New York State Legislature, and from the New York City Department of Cultural Affairs in partnership with the City Council. Endowment support is provided by the Rockefeller Brothers Fund, the Skadden, Arps Education Programs Fund, and the William Randolph Hearst Endowed Fund for Education Programs at the New Museum.